This is an inspiring, high quality guidebook for the South East of England. It is written for the recreational, non-specialist paddler and the trips are suitable for all kinds of canoes, kayaks, sit-on-tops and inflatables. The guidebook will also be useful for group leaders planning organised trips. This family-friendly guide features 26 easy but interesting paddling trips, mostly 1-3 hours long, within an hour or two of London. They provide good access and parking, include pubs and tea shops; castles and camping; and, canoe and kayak hire. 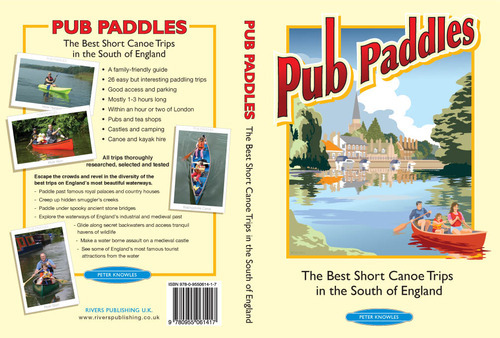 This title is produced in association with Canoe England. All trips are thoroughly researched, selected, and tested by Peter Knowles. The book itself is impressively produced, well illustrated with photos and maps with plenty of tips and advice of what to do in the surrounding areas other than paddling and a few bit’s of trivia thrown in as well. Seeing as it describes three trips within a few miles of my home just outside Oxford I thought I’d pick one that I’d never done before; the Wolvercote Circuit. This follows a route down the Thames from Wolvercote to the edge of Jericho and returning up the Oxford Canal to rejoin the Thames just above the start. It’s an area I’ve walked many times and am quite familiar with despite never having paddled it. So how did it go? Well we probably looked a little over dressed in our creek boats and white water paraphernalia, but at least it kept the drizzle off and us warm. The major hazards on route were avoiding fisherman’s rods sticking out from the right hand bank and dodging on coming rowing boats of which there were quite a few. These vanished once we joined the canal however. Entirely my fault was the fact that we got lost, twice, which seems like quite a feat on a circular route. This was mainly to my inability to remember a map, and tell the difference between a ditch and a river! Of the three pubs on route we found the entrance to ‘The Perch‘ and ‘The Trout‘ is right by the start. Somehow we completely managed to miss the ‘Plough‘ though, which is a shame as it’s roughly half way around the route and, based on previous visits, probably the best of the three, although I have a soft spot for the ‘The Perch‘. We ate at the ‘The Trout‘ after we had completed our paddle, not something that I’d recommend I’m afraid. I was disappointed to find that the canal passes within metres of one of my favourite Oxford pubs, ‘The Old Bookbinders‘ and it isn’t mentioned in the book at all! Still more of a drinking pub than an eating establishment I guess. All in all it was a very relaxing afternoon, very different from from my usual kind of paddling. I rather enjoyed it and will be sampling some of the other suggested trips from the book as soon as I get the chance. I’ve lived in and around Oxford all my life and been paddling for the last ten years. At any point during that time I could of done this trip, it’s literally minutes from house, but it took this book to get me out there and do it. That in itself makes it worth the asking price. The fact that it’s well produced and contains a wealth of other trips for you to waste a dull Sunday afternoon on is just the icing on the cake. Go and buy it if you haven’t already. Next time though I might leave the helmet behind. Well I managed to paddle from Donny Bridge to the Trout in about 1998. Are you impressed?! And the helmets, were you expecting low flying geese? Very impressed, go to the top of the class! As for the helmets, um, we had them and it was cold and there might of been low bridges and a rower might of hit us and, um, I can’t think of any more excuses. Actually thinking about it we did have a near miss with a goose trying to poo on us.